Make Masterpieces Out of Nightmares In Record Time! Shedding and matting are the top reasons pet parents seek professional help. Traditional coat prepping requires long hours of brushing, de-matting, de-tangling and de-shedding well before any trimming and styling can occur. All this repetitive physical motion produces a lot of muscle and mental fatigue which increases the likelihood of injury for both groomer and pet. Carpal tunnel syndrome, frozen shoulder, neck/back pain, and getting bit are real hazards for groomers. Pets experience muscle strains, aggravated skin issues, fear, shock and dryer seizures to name a few. Injury in the grooming profession is not a matter of “if”; but when, how often and how severe. There’s got to be a better way, right? We realize there's a barrage of de-shedding and de-tangling claims out there, along with far too many tools and some gimmicks. This clutter stems from the challenge some marketers face, which is to stand out among the competition by differentiating their brand. They often start out with a simple product/concept and will try to make it appear magical, as if life can't exist without it. One brand may offer a single product that claims to do everything, while another brand offers everything under the sun for convenience sake. Sometimes the message can be misleading or blatant malignant misinformation, and that really needs to stop! Let's start by explaining how to get the most from Best Shot's grooming system by Understanding the Science Behind It! To effectively improve one's grooming process and results, it's important to recognize how each of its fundamental elements interacts with each other. Knowledge of Basic Coat and Skin Physiology, as well as How Grooming Liquids Work are critical for today’s professionals. Not understanding these two elements makes for an up-hill struggle of “trial and error”, not to mention unnecessary physical and mental anguish, often leading to burn out. 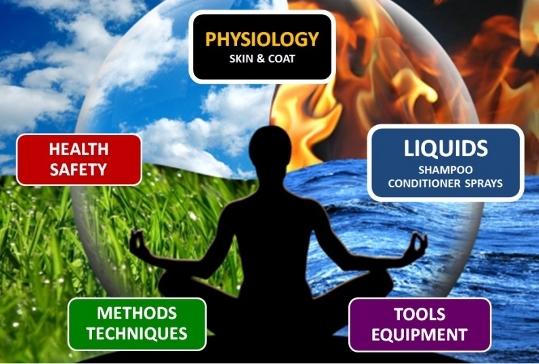 In fact, mastering these two elements leads to mastering other key elements like one’s Tools & Equipment, Methods & Techniques and Health & Safety. To best explain, let's first consider what every groomer should know about pet skin and coat types. The skin’s sebaceous glands produce sebum, a naturally oily substance which protects the hair by coating cuticle scales to seal in moisture. However, sebum acts as a virtual dirt magnet, attracting unwanted debris and oils. Shampoo works by removing the sebum together with the debris it has accumulated. Regardless of how mild or harsh the detergency is, all the cuticles on the hair's shaft are exposed. Washing can strip away the hairs protective sebum, along with any other added deposits. It's important to replace the sebum that's washed away. Hair and skin are “anionic”. That means they are negatively (-) charged by nature. As dry rough adjacent hairs rub against each other, there is a transfer of electrons produced by the negative hair charges repelling from each other. This explains how “fly-away” hair and static occur. Conversely, the cationic (+) surfactants in the conditioners one uses bond to the anionic hair and skin. Best Shot's comprehensive knowledge of this bond and experience with advanced conditioning technologies is what distinguishes it from other companies. It's what led to developing what's now the industry's preeminent grooming system. It's what drives further on-going research for more desirable hair effects and future innovations! Try taking into account the hair’s “Porosity” type, as well as the “pH levels” of the liquid products used before ever lifting a brush to an animal. Breed hair types can be characterized as low, medium or high porosity based on the degree to which their hair's cuticle scales lift over time. Dry damaged hair has more open ragged cuticles, while healthy hair appearance has more closed cuticles. Damaged coats trap shedding undercoat or snag hair leading to tangles and mats. The imagery shown below really provides a sense of how open cuticles snag and hook like Velcro, fighting the groomer while brushing. Shampoo and conditioner do not literally feed or resuscitate pet hair, because Hair is NOT ALIVE! It's nothing more than dead protein, mainly keratin. However, products can be formulated to revive its state, enhance its appearance, repair and postpone further damage. Shampoo and conditioners with acidic pH levels ranging from 4.0 to 6.5 will close lifted cuticles to some extent, while those with alkaline pH of 8.0, 9.0 or more will further lift the cuticles. Simply washing and rinsing with hot or warm water temporarily lifts cuticles, while rinsing with cold or cooler water tends to smooth the cuticle. Please understand that the hair's cuticle scales don’t exactly open and shut like a hinged door, but they can be treated effectively during the bathing process to a notable degree. Did you know your water's pH can effect, even hinder your bathing results? Why not call your water utility to determine what it's range is, or test the pH level yourself. Testing strips for pH are available online or at a pool supply store. As a professional, this is critical information to know.. Combing and brushing are the leading cause for coat damage! This begs the question as to why anyone would risk further damaging the coat by pre-brushing, without pre-treating the hair first with products designed to repair and smooth over lifted cuticles. Now animals can go straight into the washtub. 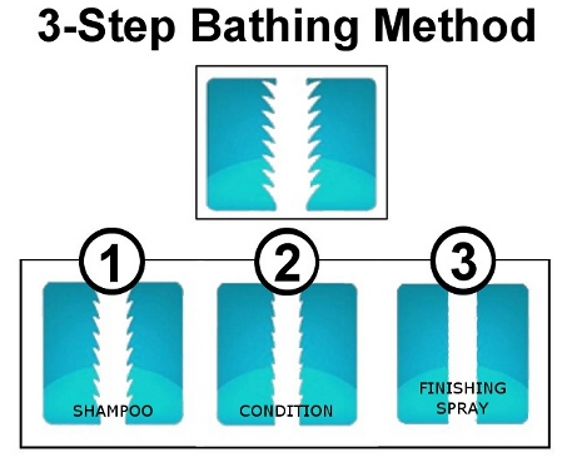 This method incorporates separate shampoo, conditioner, and finishing spray steps. Each phase of this bathing process bolsters tensile strength, repairs, further closing lifted cuticle scales, until finally sealing each hair strand with our Ultra Vitalizing Mist finishing spray. Groomers marvel at how coats safely release shedding undercoat in the tub, especially the high porosity hair of most double coated breeds. Of course this means less stress for all, which is great news for groomers! 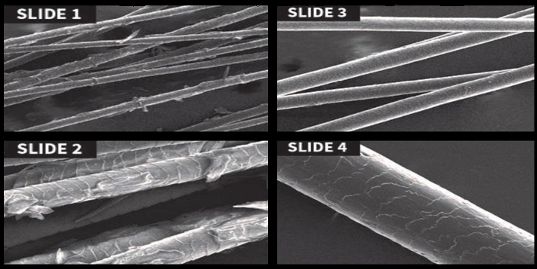 The electron-microscopy images pictured illustrate how overall effective this practice is once the hair is treated and dried. We used Best Shot’s Ultra Wash®, Ultra Plenish® and Ultra Vitalizing Mist® for this case study. Slides 1 and 2 shows filthy damaged Newfoundland hair neglected for many months. Notice the open cuticles and heavy grime build-up. Slide 3 shows how shampooing (Step 1) and conditioning (Step 2) repairs much of the damage, leaving the hair smooth and shiny. Slide 4 shows what a difference (Step 3) treating with an amino silicone spray like Ultra Vitalizing Mist now has, fully closing the cuticles, sealing and protecting the coat as the sebum was intended to do. Groomers who practice this comment on how coats appear full-bodied, comb easily, and stay more manageable for weeks. However, some groomers continue to rely solely upon a conditioner or cream rinse for mats & shedding, while still others rely totally on their de-tangling spray while vigorously pre-brushing. The main objection to pre-brushing is when the hair's cuticle scales are so severely lifted, they may get severed by one's grooming tools; further exposing the hair's inner cortex or fraying its ends. One must also consider how water saturated hair becomes spongy, and more prone to breakage when wet combing is being applied. Therefore the secret behind adhering to our 3-Step approach rests in how it mindfully and efficiently conditions the coat repeatedly; once each phase (1 - shampoo, 2 - condition, and 3 - finishing spray). This ensures that the majority of the coat’s hair strands are hydrated, bolstered in strength, and smoothed over: thus sealed before drying. Think of this "progressive grooming logic" as a Close, Further Close, Totally Close method. After treating the coat with Best Shot following its progressive grooming logic, groomers now realize how it enables their HV Dryer to release more shedding undercoat than ever before. One can preferably use the dryer in place of a brush, leaving many coats virtually tangle and mat free. Shedding undercoat releases easily in the tub and as one dries now that lifted cuticles are closed. Once completely dried, any lingering mats and tangles work out with significantly less effort and minimal damage to the coat. Think about that. You can effectively brush with “air” avoiding further tool damage. More cuticles are closed, so more shedding undercoat and matting is freely released with the force of the dryer rather than all that pulling or tearing with a brush or comb beforehand.  NOTE: Severely pelted coats are the result of serious neglect over time and have typically reached such a point where they can’t be effectively treated or saved. Festering sores and skin conditions are commonly found lingering underneath the accumulation of felted matting which requires shearing down the coat entirely. However, now many groomers find they can save more of the coat adhering to our 3-Step System and the method discussed above. Take for example a thick abundant coat Cocker Spaniel whose underbelly is severely pelted. The groomer now has the option of only removing the matted underbelly, while saving the skirt and legs using these methods. The client is now thrilled and the dog keeps its dignity. A win/win for sure! As you further explore all that can be accomplished with Best Shot's grooming system, witness its effect on various coat types and grow in confidence. It's just a matter of time until you're ready to take on greater challenges you never imagined doing before. Remember it's important to progress at your own pace, and to be mindful of each pet's unique circumstances. Best Shot’s 3-Step Grooming System and methodology will forever change how you groom! Some final thoughts. Would you reserve the best product only for your toughest challenges, and use a lesser product for routine ones? Why work harder? Try grooming smarter with Best Shot's Coat Release TechnologyTM on every pet you bathe. Witness firsthand how much time and effort is saved, not to mention your notable increase in productivity each day! Apply your knowledge of pet hair physiology along with Best Shot’s trusted chemistry and mastery of tough grooming challenges. Soon you’ll be Making Masterpieces In Record Time!